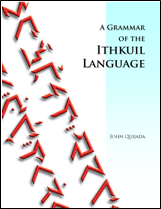 This website presents a comprehensive grammar of a constructed human language, Ithkuil. The original version of the language was posted to the Internet in January 2004. A variation on the language called Ilaksh, designed for easier pronunciation was posted in June 2007. These two versions of the language have now been replaced by a new, definitive (and final) version of the language as of July 2011. For those familiar with the history of artificial language construction, Ithkuil represents a cross between an a priori philosophical language and a logical language. It is by no means intended to function as a “natural” human language. Ithkuil exists as an exercise in exploring how human languages could function, not how human languages do function. Acknowledgements: I wish to thank all of those who have taken an interest in Ithkuil, including Stanislav Kozlovskiy, whose 2004 article “The Speed of Thought” brought Ithkuil to the attention of so many people in the Russian-speaking world. Спасибо, Стас! Thanks also to Lexa Samons for his hard work in translating the original Ithkuil site into Russian and to fellow linguist and conlanger David J. Peterson for bestowing upon Ithkuil the 2008 Smiley Award.